Change can be hard – real hard. I live a very different life at work and at home. At work there is chaos constantly – and I love every minute of it. I long for change at work – for things to be shaken up, and to try and put the pieces back together again – like a big puzzle. If things stay static for too long, I get a little antsy. At home, it is a completely different ball game. I think one of the reasons why I can deal with such chaos at work, is because things are pretty stable at home. Well, most of the time. Tonight I attended a meeting at the new school my daughter will attend next year. This is going to be the 5th school she has attended since kindergarten, and next year she will be in 7th grade. The district likes to move them around – and it makes me sick. Unfortunately she is being separated from the majority of her friends, and being taken out of a school that she has grown to love in only a few short months. This new school has nothing. It will start from the ground up. There are no teachers. There are no books in the library. There isn’t a mascot. There is no orchestra, band or choir. There is only a principal who was hired to take on this great task. And there are tons of very unhappy parents. I had to fight back my tears as I heard parents tell their stories – stories about kids who have finally found their niche in the school they currently attend, only to be redistricted to a new school with lots of uncertainty. I look at my daughter though in sheer amazement. Sure, there were plenty of tears when she heard about the school board’s plan – but when the decision was made, she took the high road. She sees this as an opportunity – a chance to create a school the way she envisions it. She is an extremely strong willed 6th grader – she is a leader, and boy am I a proud parent. It doesn’t make it any less painful for me – but knowing that she has a positive attitude is the only way I am going to deal with this change. Last weekend she wanted to make sure she had something easy to eat for breakfast in the morning. She found this recipe in Cooking Light – and was planning to make it for herself. Unfortunately homework got in the way – so I decided to help her out (I know, twist my arm) – as I was making it though, she ran into the kitchen to remind me to make sure the coffee cake had lots of cinnamon. I told her that the recipe had nutmeg instead – to give it that eggnog flavor – that’s where she drew the line. She didn’t want that – she wanted a cinnamon coffee cake – that’s what she is used to. 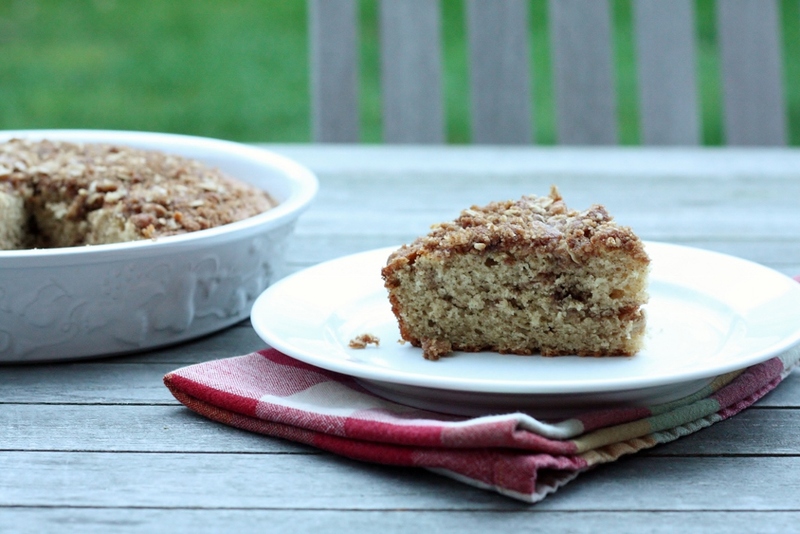 This coffee cake was delicious – nice and moist, with lots of flavor. Cinnamon or nutmeg, you can’t go wrong. Again, change can be hard at times – and if this is the only change she wants to resist – I am completely supportive. To prepare crumble, combine first 4 ingredients in a bowl, stirring with a whisk. Cut in 2 tablespoons butter using a pastry blender or two knives until mixture resembles coarse meal. Stir in toasted pecans. To prepare cake, weigh or lightly spoon 6.75 ounces flour into dry measuring cups; level with a knife. Combine 6.75 ounces flour and next 4 ingredients (through 1/4 teaspoon salt); stir with a whisk. Place 3 tablespoons butter and granulated sugar in a medium bowl; beat with a mixer at medium speed until well combined. Add whole egg and egg yolk, 1 at a time, beating well after each addition. Add milk, sour cream, and vanilla; beat at low speed for 1 minute or until well combined. Add the flour mixture; beat at low speed 1 minute or just until combined. Spoon half of batter into an 8-inch round metal cake pan coated with baking spray. Sprinkle with half of crumble mixture. Spread remaining batter over crumble, smoothing top with a spatula. Sprinkle evenly with remaining crumble mixture. Bake at 350° for 30 minutes or until a wooden pick inserted in center comes out clean. Cool in pan on a wire rack for 15 minutes. Place a plate upside down on top of cake; invert onto plate. Place another plate upside down on top of cake; invert onto plate.